One of the most famous islands in the world, Capri, needs to make your bucket list! If you have the time, put this island in your itinerary. For those who have yet to make it to the island, navigating Naples will be your biggest obstacle. There are several groups, guides, and agencies eagerly pushing their services toward this island. The truth is, you can get to the island on your own, with out their help. Here are things I have observed at the ports, and train stations, in Naples. Many “helpful” Italians dragging travelers to their destination. Tour guides frantically trying to find their patrons. However, here are four steps to get you from Naples to Capri. Arrive at Napoli Centrale. Wherever you are coming from you must, or it’s recommend, you end up at Napoli Centrale – the central station. From there, purchase a train/bus ticket from a tabaccheria in station, and walk directly out the front doors to Piazza Garibaldi. Take the metro (bus and metro tickets are interchangeable) and get off at Mergellina. Head toward the water, and the port will be to the left. Find Molo Beverello. When taking the hydrofoil to Capri, you must embark from porto Molo Beverello. It is not located outside the central train station. There are several ports in Napoli, but I recommend using porto Molo Beverello to get to Capri fast. Buy your Ticket. There are two types of ferries that service Capri – and therefore, two prices. There is a regular ferry and there is a hydrofoil (or fast ferry). Both types of ferries leave from porto Molo Beverello. Suggetion: The ticket lines for the ferries are deceiving. There are around 30 + ticket windows all with different companies and offers. It’s overwhelming. To put you at ease, most all the ticket counters sell every ticket for every company. Observation: Often, two of the ticket windows’ will have extremely long lines, because the travelers believe their ticket can only be purchased from a specific window. Not always the case. Don’t hesitate to walk in front of the crowds, a few windows down. Cost: The average cost per ticket on a hydrofoil is €20. Timetables: There are several ferries that leave throughout the morning, and evening, but only a few in the afternoon. Money: The food on the island is expensive. If you are going for the day, or weekend, buy wine, and a picnic lunch a head of time. Suggestion: bring a great pair of walking/running shoes, and your trunks! Arrive in Capri. When the ferry docks in Capri, you have several avenues in which to see the island. All avenues are accessible from the information centers right next to the harbor. 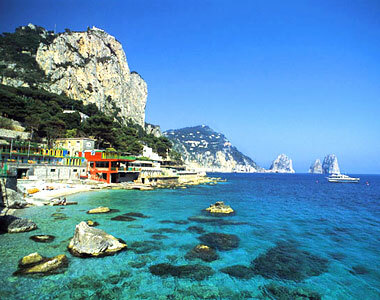 Capri is one of the most beautiful islands in the world. I strongly recommend everyone visit at least once.